Barbara began her musical life when she was 4 years old. Sitting at the family’s chartreuse piano and playing Happy Birthday by ear and with both hands, her father, who had been a drummer in his younger life, was thrilled. Determined to encourage her interest in music, he signed her up for piano lessons with the neighborhood teacher, beginning a life-long love of music. As she grew up, he would share his music appreciation and knowledge with her by playing his big band albums and teaching her how to play the drums on her knees or any other surface. Barbara loved all kinds of music and even sang along with vocal jazz albums in the family collection. As a young woman and a single parent, Barbara focused on raising her own daughter. Facing that challenge, she enrolled in school and overcame many difficult circumstances to get a graduate degree in psychology in 1978. She developed a specialty in psycho-oncology, consulting for a comprehensive breast center for 19 years. Out of necessity, her musical interests were temporarily pushed to the background. However, over the years, as Barbara developed a very successful private practice, which now includes individual and family therapy, music, and in particular, jazz, always continued to play important role in her life. In 1994, following the suggestion and encouragement of her friend Ellen Cohn, a prominent Jazz recording industry executive and who had recently passed away, Barbara decided to start a music business and created BJB Jazz Ventures. Her first project was producing a memorial concert, in association with MAMA records, to honor Ellen at Catalina Bar & Grill. Catalina Bar & Grill is the premier jazz club in Los Angles, and Catalina Popescu, the club’s owner, was more than happy to provide the space and support. With the assistance of Catalina, Barbara went on to produce several jazz brunches and tribute concerts, including a special tribute to Carmen McRae. Barbara and Kirk Silsbee jointly produced a tribute to jazz pianist, composer and founding leader of the Pan Afrikan Peoples Arkestra, Horace Tapscott. Barbara’s career in music continued to prosper and she cut back her psychology practice to four days a week so that she could take on a part-time position doing A & R for MAMA Records. She worked with the label for a year before they closed their doors. In 1996, Barbara and Catalina Popescu talked about doing something at her club that would benefit the jazz community and aspiring young musicians. This conversation led to the creation of the Young Artist Jazz Series. The creation of this ongoing series provided a venue for local young jazz artists to showcase their talents in front of a live audience. The series was an immediate success as requests to participate poured in from young jazz musicians almost daily. Barbara expanded on the series by reaching out to local high schools that had jazz programs and inviting them to perform. The series quickly became booked a year in advance. As a result, on a monthly basis, the audience at Catalina’s had the opportunity to hear and discover these extraordinary talented young people, many of whom have gone on to become professional jazz musicians. In fact, most successful jazz musicians under 45 years old who are from the LA area have likely performed in the series. Barbara has used some of those musicians on CD’s she has produced. Barbara loves going to concerts where she gets to re-acquaint with and listen to musicians who had their first performance as part of the Young Artist Series. Barbara is so grateful that she has been able to nurture and support these young artists over these many years and that she played even a small part in their musical journey. The Young Artist Jazz Series continues to be one of her most satisfying accomplishments. In 1999, Mark Winkler, a very successful smooth jazz artist, wanted to do a more straight-ahead jazz CD. Recognizing Barbara’s organically tasteful song choices and production skills, Mark reached out to Barbara to produce the CD. The album, “Easy the Hard Way,” was released in 2000 and garnered terrific reviews. 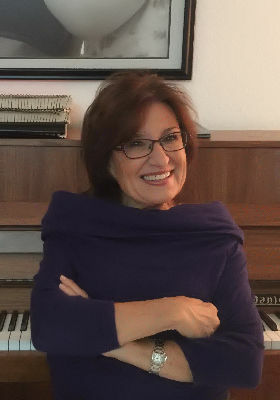 Barbara went on to produce 5 other Mark Winkler CDs, including “Mark Winkler Sings Bobby Troup,” “Till I Get It Right”, “West Coast Cool” (with Cheryl Bentyne from the Manhattan Transfer), and most recently “Jazz and Other Four Letter Words” and “The Company I Keep,” all of which have received stellar reviews. Now, as a sought after music producer, Barbara was hired to produce highly regarded CDs for vocalist Judy Wexler, including “Easy on the Heart,” “Dreams and Shadows,” and “Under a Painted Sky” and the soon to be released “Crowded Heart.” Other production credits include, “Happy to Be” for veteran jazz vocalist Julie Kelly. This CD was a favorite with jazz critics coast-to-coast. In 2018 she produced vocalist Gary Brumburgh’s CD “Moonlight” and Beverley Church-Hogan’s CD “Can’t Get out of this Mood.” Both of those projects have received outstanding reviews. Barbara continues to enjoy a busy and challenging producing schedule for 2019. Her love of jazz as well as the combination of skills in song selection, arranging, associations with professional accomplished musicians and the technical skills, enabling her to communicate with recording engineers, will continue to drive demand for her services for years to come.